~My Broken Eggshells~: It's Time To Drive! You guys are probably wondering what the title is all about now haha... Well seeing as I am 17 and college is just ~ a year away, my mom thought it would be important to start teaching me how to drive! She always used to be against me learning to drive while in high school, but something must have changed her mind. She asked if I wanted to go out driving with her car yesterday and of course without hesitation, I said, "yes!" I was actually shocked at how fast I picked up turning skills. When I though about driving, I thought it would be hard, but in reality it wasn't that bad. I did have trouble with the steering wheel in the beginning, but I quickly got used to using it with the help of my mom! Being as nervous as I was, I even asked my mom what to wear to drive! My mom kinda laughed and told me to wear whatever I wanted as long as it wasn't a dress or heels. Therefore, I chose to wear this outfit that you see above. I wore my navy blue top that I picked up last fall. This top is super cute and I love wearing it. It was a lace knit shirt which means it had what looked like cut out designs on it. Under the shirt, I wore a cami in the same navy blue color. For my jeans, I wore some comfortable gray jeggings and finished my outfit off with brown boots. I also wore some jewelry to go driving which I kinda regret now. My necklace was okay and didn't bother me when I drove. However, my bangles made it hard for me to use the steering wheel. They were moving up and down my arm and I got distracted trying to fix them. I eventually decided to take them off. For any of you learning to drive, I recommend staying away from bracelets while you are learning, especially if they would distract you. This was quite the fun experience and I definitely can't wait to go driving again next weekend! The 90 minutes passes by really fast! In fact, we lost track of time for a while until we noticed that the sun was setting! Here is a photo of my mom and I after our driving lesson! We positioned ourselves perfectly so the light from the sun would hit us perfectly! 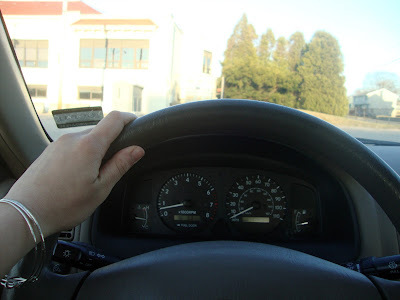 Do you guys remember your first driving experience? How do you feel about lace knit tops? I personally love them! They are cute and can be easily dressed up or down. Good luck with your driving courses, and your lace knit top is very nice! Thank you so much!! Happy Easter to you too!! Look at you behind the wheels! Nice. Have fun and happy Easter. Happy Easter! Have fun learning how to drive. Yep! No accessories while learning to drive and definitely no heels! Skirts are fine but for me, I am not that feminine of a person so when I wear skirt and drive it just looks wrong and vulgar without me trying lol! haha thanks! It was a lot of fun and yes, my mommy is super sweet!! I have never heard of auto transmission cars before (i guess I should read a manual haha) but if they are eaiser,I am all for it! You'll get the hang of driving soon, it's easy! :) I've never tried manual before but if you drive auto it's a lot easier and there's only two pedals. Oh and you should listen to your mum's advice when she says no driving with heels because it really changes your footing on the pedal. Thongs can be annoying as well. I hope I do !! Then I can get my permit and drive to school!! I think I want to try auto especially if there is only two pedals! Less confusion! I will listen to my mom haha. I don't want to crash! You look so cute with your mom! We mostly drive automatic here and don't worry :p you will get used to it! but for your first time, it seems like you are really great at it already. Aww thanks! I can see how driving can be a pains ometimes especially when your friends all ask you for rides. I think auto might be where I am headed next. How exciting!! The first time I ever drove I was SO excited. It's such an amazing feeling especially once you get your license and you feel so FREE!! 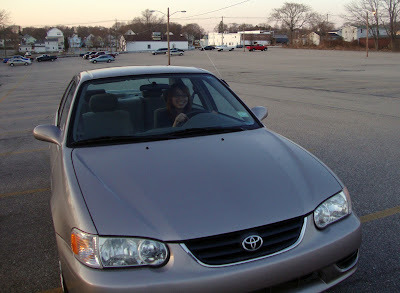 :) My mom actually let me drive around a parking lot in 8th grade. That was the first time I ever drove. Then I got my permit when I was 15 and drove all the time with my parents, and the day after I turned 16 I got my driver's license. It was one of the happiest days of my life! Lol. :) I agree about not wearing anything distracting. Also while you're learning I would keep the radio off, cell phone off (or on silent), etc. so you can concentrate on driving. Wow! 8th grade is so young! You got your permit and license really early. I am a bit lazy so I keep putting it off! I will def. be putting all my concetration onto the road. It would be terrible if I got into a crash or something! oh my goodness i spent a good chunk of high school rolling around the suburbs in a corolla just like this! best of luck learning! driving is such a rite of passage full of freedom! have fun and stay safe behind the wheel! haha.. this will probably *hopefully* be me one day!! I know what you mean by freedom! With a car I can go anywhere I want!!! Haha, driving is fun! Although since I'm in nyc, I only get to do it when I'm in the suburbs. true!! In NY, there are subways and buses.. plus all that traffic.. haha walking might be faster! Watch out! another Asian is learning to drive:) haha. Please do well and represent! and don't let the stereotype be true. hahah. haha thanks!! I will represent!! I will be a good asian driver! haha that is going to be me!! thank you for these tips!! You are very motivating! good luck with learning to drive! I'm 33 and don't know how to. Thank you!! I bet you can still learn! good luck with your driving lessons!! :D yay!! Your looks like a lovely driver. I love it your boots.